The hull of the Stingray is a small, light-weight, carbon-fiber shell with a biomemetic design reminiscent of its ocean-dwelling namesake. This hull was designed and hand-crafted by the iBotics team in 2007 and has since affected almost every design decision on the vehicle by serving as both a rigid size constraint and inspiring standard of quality and craftsmanship. The streamlined profile of the hull provides very low drag and allows the Stingray to glide almost effortlessly through the water. The hull of the Stingray is unsealed, allowing the main cabin to flood when submerged. This keeps the volume of the pressure vessels to a minimum, helps to cool the contained electronics, and eliminates the need to reinforce the hull against compression. For the 2009 Stingray, the wings and tail have been completely redesigned. Each of these extremities has been engineered to improve the buoyancy of the vehicle while decreasing the vehicles dry weight. These structures were designed and built by the iBotics team using a 3-D printing machine. Each of the structures houses one of the vertical thrusters used in the Stingray's propulsion system and is also machined with mounting brackets for each of the hydrophones used in the sonar system. The tail is constructed with a sealed air cavity that increases buoyancy in the aft. This levels the Stingray's static pitch angle, minimizing the amount of work performed by the rear thruster in maintaining pitch during operation. 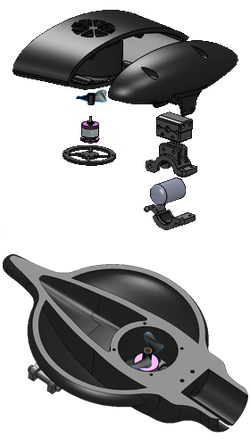 The image at right shows an exploded view of the wing including the vertical thruster and the hydrophone mount. Each of the wings is built with a two piece design. The first piece houses a vertical thruster and is printed with an exposed center cavity where strategic amounts of closed-cell polyurethane foam can be stored. The end cap allows easy access to the center cavity and completes the hydrofoil of the wing when attached. The end caps are printed with mounting brackets for the hydrophones. The image at right shows a cross section of the tail.